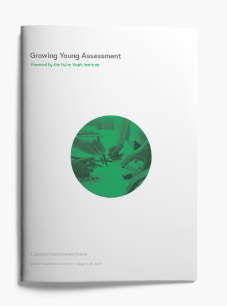 The Church Growing Young Assessment leverages the research done in the Growing Young project to determine six scales by which to measure your church. When you take the Church Assessment, you and your entire congregation participate in a survey for immediate results detailing your churchs strongest and weakest areas according to Growing Young research. A 30-page report will integrate all responses into graphs of aggregate results, provided immediately upon completion. The report will also highlight next steps according to your results. Included in the cost of your church assessment is a one-hour call with an experienced Growing Young coach. Your coach will help you and your team gain the maximum insight from your assessment report and help you strategically set your next steps. A member of the FYI team will contact you shortly after you complete your assessment in order to schedule the call at a time that is convenient for you.